At the recent Illinois Fertilizer and Chemical Association meeting in Peoria, IL, many people were talking about the Polar Vortex and windchill (in the negative-40-degree range most of the time). But in the warmth of the Peoria Civic Center, some attendees were taking stock of the many items that were part of the silent-auction process. One of these happened to be a model of the Black Beauty sprayer from AGCO. AGCO’s SS1074 “Black Beauty” sprayer at the 2006 MAGIE show. Now if you happened to be around in 2006, you got to experience the full-scale version of this special sprayer from the company. In that year the annual Midwest AG Industries Exposition (MAGIE) was held in Decatur, IL, instead of Bloomington. 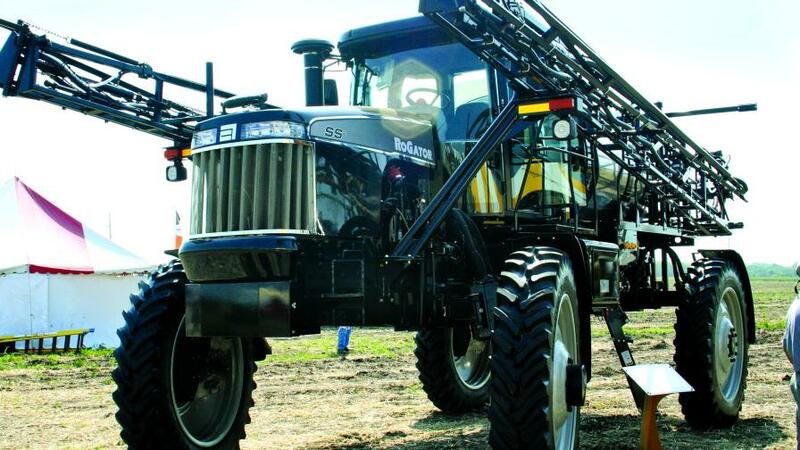 Perhaps to celebrate this fact, the folks at AGCO decided to feature a special edition of its SS1074 sprayer, sporting black and silver paint instead of the company’s familiar yellow. According to the company, this paid tribute to the first Ag-Chem sprayer model. In terms of features, the Black Beauty had a carbon steel C-Channel frame for absorbing shocks and flexes on rough terrain and a “tucked up” undercarriage to minimize crop damage. Top speed of the unit was 12 to 32 mph. Since 2006 the Black Beauty hasn’t returned for an AGCO industry event. However, in its one year on the scene, it made enough of an impression to have its own scale model produced.